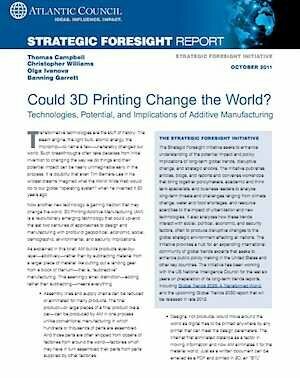 Must Read Special Report: Could 3D printing change the world? Click to download the PDF of this report. Transformative technologies are the stuff of history. The steam engine, the light bulb, atomic energy, the microchip—to name a few—unalterably changed our world. Such breakthroughs often take decades from initial invention to changing the way we do things and their potential impact can be nearly unimaginable early in the process. It is doubtful that even Tim Berners-Lee in his wildest dreams imagined what the World Wide Web would do to our global “operating system when he invented it 20 years ago. “Could 3D Printing Change the World? Technologies, Potential, and Implications of Additive Manufacturing,” which you can download here. It’s the latest Strategic Foresight Initiative Report, co-authored by Thomas Campbell, Christopher Williams, Olga Ivanova, and Banning Garrett.” It’s sponsored by The Atlantic Council of the United States, a non-partisan organization that promotes constructive US and European leadership and engagement in international affairs based on the central role of the Atlantic community in meeting today’s global challenges. Assembly lines and supply chains could be reduced or eliminated for many products. AM can produce the final product — or large pieces of a final product — in one process. Designs, not products, would move around the world as digital files are printed anywhere with any printer to meet design parameters. A “STL design file can be sent via the Internet and printed in 3D. Products could be printed on demand without the need for inventories. A given manufacturing facility would be capable of printing a huge range of products without retooling—and each printing could be customized without additional cost. Production and distribution of material products could become de-globalized as production is brought closer to the consumer. Manufacturing could be pulled away from “manufacturing platforms like China back to the countries where the products are consumed, reducing global economic imbalances as export countries’ surpluses are reduced and importing countries’ reliance on imports shrink. The carbon footprint of manufacturing and transport as well as overall energy use in manufacturing could be reduced substantially and thus global “resource productivity greatly enhanced and carbon emissions reduced. Reduced need for labor in manufacturing could be politically destabilizing in some economies while others, especially aging societies, might benefit from the ability to produce more goods with fewer people while reducing reliance on imports. The United States, the current leader in AM technology, could experience a renaissance in innovation, design, IP exports, and manufacturing, enhancing its relative economic strength and geopolitical influence. Read it. Pass it around. Share your thoughts here.